The ritual was the same every morning. While my brothers and I ate breakfast, my mom deposited a pink, frozen sheet of mystery into a frying pan. It steamed and sizzled on the stove, sending an ominous aroma across the kitchen. Depending on your mood, it either smelled tantalizingly greasy or like a mortuary full of wet laundry. Meaty, but also medicinal. Vaguely locker-roomy. “Do you have to do that now?” asked one of my brothers. My mom hummed to herself as she layered the pallid beef on a French roll, topped it with iceberg lettuce and Monterey jack cheese, and wrapped it in aluminum foil. The sturdy package was popped into a brown paper bag along with an apple, a Doritos, a Ho-Ho, and a note that assured me I was special. That was my school lunch, and I loved it. There was something about the texture of Steak-umm that my reptilian 7th-grade brain found satisfying. The uniformity of the beef’s folds; the way it caved and melted with the slightest pressure from pre-orthodontia teeth; the promise that its blunt plain grease emissions would soften even the crunchiest bread. It tasted as comforting as anything else in my teen years. I’m a grown man now. My life involves dining in some of Chicago’s most acclaimed restaurants and professionally opining on it. And yet, I still crave Steak-umm at odd moments. I’d smell something in, say, the checkout line at IKEA, and suddenly—in zitty, Proustian waves—I was back in my childhood kitchen stressing about an algebra test. The questions would pile up: Was it as good as I remember? What was it? Was it even meat? (The product’s name, which sounded almost cagey—“Steak? Umm…”—offered no clues.) The craving generally passed. The questions went unanswered. I went online and the floodgates opened. NPR tells me that Steak-umm was invented in the late-’60s by Gene Gagliardi, a suburban Philadelphia meat manufacturer who wanted to replicate cheesesteaks for home cooks. So he put meat through a grinder repeatedly, formed in a mold, froze it, tempered it, sliced it, cooked it. 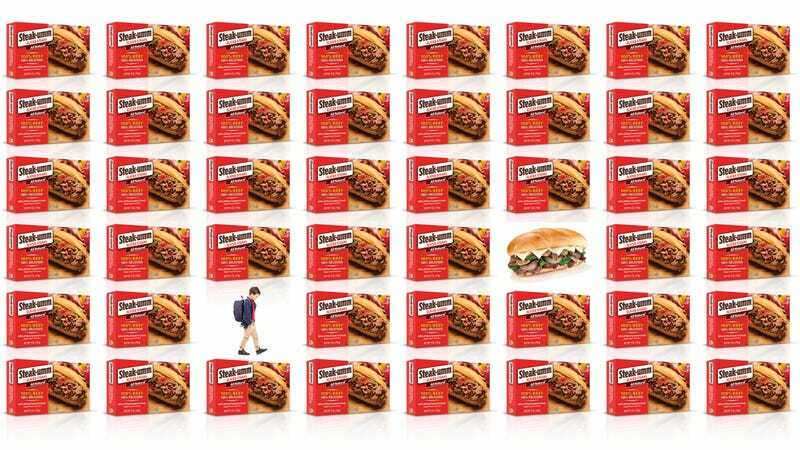 At the company’s height, Gagliardi’s meat-processing plant was slicing a million Steak-umm slices a week. In 1980, he sold the company to Heinz for $20 million, and went on to invent popcorn chicken—which he sold to KFC in 1992. I was also surprised to find Steak-umm’s Twitter feed both active and hilarious, trading barbs with William Shatner and poking fun at Neutral Milk Hotel on the 20th anniversary of In The Aeroplane Over The Sea. But perhaps most earth-shattering was the fact that Steak-umm was still being manufactured, by Quaker Maid Meats in Reading, Pennsylvania. It’s the nuclear fallout cockroach of grocery foods. I’d forgotten how quickly the meat cooks. It pulsates and undulates, shifting from bubble-gum pink to ashen grey to menacing brown in 30 seconds. By the time you flip it, it’s wispier than a rumor. Wait 15 seconds too long, and it curls up into little mounds of meat-mush. Of course, my mom never served me Steak-umm fresh from the pan. So I wrapped my third effort in foil and placed it in a warm closet for four hours to approximate the school-locker time my old sandwiches endured. That did it. The bread softened. So did the cheese. Even the lettuce. It was as though the Steak-umm had forced its texture on everything else, gaining strength while sapping the other ingredients of theirs. The sandwich now had the slippery wet-sponge consistency of a Chicago-style Italian beef saturated in jus. It wasn’t good; I was struck by how unsalty the whole affair remained. But it had the familiar, safe temperament that marked my childhood. I tried the same ingredients, but added sautéed onions and peppers, and sprinkled the meat with garlic salt. Then I toasted the roll. Boom. Sweet, salty, crunchy, soft. A decent sandwich. But in this alien context, the meat itself seemed confused, as if cowed by its exotic new companions. It appears that Steak-umm functions best when rendered irrelevant—an unobtrusive protein placeholder that houses little more than childhood memories. A neutral meat hotel.